thomaesplendor | "…like the sun he heated the world with the warmth of his virtues and filled it with the splendor of his teaching." "…like the sun he heated the world with the warmth of his virtues and filled it with the splendor of his teaching." In his magnificent new article at First Things, Fr. Thomas Joseph White O.P., considers the incompatibility of diverse and splintered versions of classical liberalism. He notes that the increasingly ubiquitous dogmatic version of leftism (as opposed to libertarianism) is more reactionary than based on autonomous principles. It should not be surprising then, (especially as the West is abandoning real conversation) that there is an equal but opposite reaction, that which has been labelled as the “alt-right” or “Trumpism”. Fr. Thomas Joseph points out that these are merely two sides of the same coin. Whereas one pushes a secular globalism, the other pushes a secular nationalism. Of course, each side then sees the root cause of our ills to be either a view of politics which is global or one which is national. What they share is a secular foundation. Truth be told, it is only the Catholic Church in human history that has shown any real long-term success in sustaining in concord the twin principles of balanced nationalism and ethical universalism. The caricature-substitutes of secular modernity that vie against the Church always err on one side or the other, usually to the detriment of both. Of course, the Catholic intellectual tradition recognizes that the universality of the human condition does not necessitate tension between different nations. As such, Fr. Thomas Joseph points out that St. Thomas Aquinas includes piety toward the patria as a virtue which is constitutive of the moral life. And yet, as with all virtue, piety toward one’s fatherland and culture is a mean between two extremes. With a correct vision of the deficiency of unchecked globalism, the alt-right makes a crucial prudential misstep in swinging toward the other extreme, which we might label as radical nationalism, often incorporating a kind of racism and cultural idolatry. True piety for one’s fatherland, however, necessitates a rejection of this idolatry. It seems to me that a true love of one’s culture necessitates a recognition of the culture of the other in order for that love to remain intelligible. This does not mean that all cultural lines should be obliterated. On the contrary, it means that cultural variation is celebrated. There is something about seeing another culture as alien which allows for the love of one’s own culture as that which is familiar. In other words, the view of one’s culture as universally normative destroys its status as unique. Does this require that we affirm a cultural egalitarianism? I do not think so. After all, it seems to me that culture is by definition something secular. Religious life in the Church is something which transcends the merely cultural precisely because it speaks to man universally, as called by God to a supernatural end of beatitude. Aspects of Church practice may have arisen out of and alongside a culture, such as how Gregorian chant arouse out of 9th century western Europe. Even if they begin rooted in cultural context, things like liturgical practice are most properly put forth by the Church as belonging to the arena of the religious which is distinct from the secular even as it is interwoven and connected to it. These practices speak to man qua man, not man qua Swiss or man qua Indonesian. As such, it is not cultural idolatry for the Church to prescribe Gregorian chant for Christians the world over. In fact, even if culture is entirely secular, we may be able to make value statements when comparing and contrasting different cultures. The necessity of a respect for other cultures which true patriotism requires does not necessitate that we value all aspects of all cultures equally. It is, after all, only common sense to more greatly respect the culture which affords human dignity to prisoners of war rather than one which enslaves them. Culture can be judged by adherence to the natural law, which is universal. Particular cultures are not universal, but the fact of culture as constitutive of the human experience is. And just as all humans share the fact that they arise out of a particular culture, all humans share a law of their nature. We may go so far as to say that by culture we mean precisely the varied and creative ways in which the natural law can be respected, upheld, and celebrated by different groups of human beings. Indeed, culture arises out of differing responses to universal human phenomena: weddings, coming of age, the harvest, death, etc. This is the genus of culture itself. That which unites all cultures is that they deal with human nature and how humans acts, how they live. How humans act is measured by the natural law. If having a culture (a particular response to these universal phenomena) is natural and good, and if culture itself means a fitting response to human nature and the natural law, then deviation from the universal norms of nature and goodness are perversions of culture, a lack of culture. In sum, this Thomistic definition of culture, I believe, allows us to reject both the idolatrous universalization of culture and the relativistic denial of cultural judgment. This morning, during a speech given for the Italian National Liturgical Week, Pope Francis commented on the liturgical reform called for by Vatican II. In that statement, Francis is quoted as having said that, “the reform of the liturgy is irreversible.” The Holy Father continued to speak of the long path toward liturgical reform that the Church has been on since the pontificate of Pope St. Pius X. This raises a number of interesting questions, not the least of which regards the true intention of the council fathers concerning liturgical renewal. Sacrosanctum concilium calls for the preservation of Latin (both spoken and sung), and Pope St. John Paul II spoke of the role of Latin even among liturgical renewal stating, “The Roman Church has special obligations towards Latin, the splendid language of ancient Rome, and she must manifest them whenever the occasion presents itself,” (Dominicae Cenae §10). The question of priestly orientation (that is, ad orientem or versus populum) in the Novus Ordo Missae remains hotly contested, with vastly different interpretations of the GIRM. Cardinal Ratzinger himself has questioned the necessity of versus populi orientation. I do not wish to get into liturgical details here but merely to cite the above as a simple illustration; while many agree that liturgical renewal ought to follow the lines set out by the conciliar fathers, there is far from a consensus as to what those lines are. What precisely is irreversible? The spirit of the reform? Ministerial orientation? The usage of the vernacular? Pope Francis’ speech today once again raises all of these questions. While pundits and theologians alike are using Francis’ statement to defend this or that liturgical practice, the fact of the matter is that there is certainly not a uniformity in liturgical practice in the Latin Rite, and I think that that exposes a confusion at the level of liturgical law. With that being said, I believe that there is something even more important than a consideration of the extension and scope of Francis’ remark. One is left wondering how liturgical reform can be called ‘irreversible’ in the first place. The very concept of reform presupposes that we are speaking of a practice over which the Magisterium has jurisdiction. We do not speak of Magisterial jurisdiction over scriptural truths, for example, because these are not created or modified by the Magisterium; they are simply interpreted as aspects of divine revelation. However, discipline is subject to rule and regulation. Reform of discipline is often a response to radical shifts in culture so as to more efficiently and prudently spread the Gospel, distribute the sacraments, and lead souls to Christ. The very basis of the liturgical renewal begun by Pius X, confirmed by Pius XII, ratified at Vatican II, and encouraged today by Pope Francis presupposes that discipline be mutable, the precise opposite of ‘irreversible’. So what does Pope Francis mean? Of course, we ought to give him the benefit of the doubt. We ought also to be patient for clarification. The most intelligible interpretation is that Pope Francis thinks that the post-conciliar liturgical renewal will not be going anywhere soon, that is, it is irreversible in the Latin Rite at this time in history. This would mean that he intends ‘irreversible’ to pertain only to a certain context and not to be taken absolutely or too literally. Such an interpretation would allow us to maintain a hermeneutic of continuity with the liturgical tradition. We ought to be wary of any view which insinuates that the liturgical renewal of Vatican II is a movement from the bad or ineffective to the good or effective, as if the Church is just now getting participation in Christ’s mysteries and the official prayer of His Church straightened out. Beneath organic development of discipline remain certain unchanging sacramental and liturgical truths which bind us universally not just across geographic location but across time itself, a bridge to the past. If, however, we are to uphold the catholicity of the liturgy, we must maintain that none of the licit variations across times or rites are themselves immutable or irreversible. This seems to be the most sensible reading of today’s comments. In short, only those things which are not subject to renewal, reformation, or variety are truly and completely irreversible in the liturgy. This article by Kenney admirably hits upon some of the Neopelagian sources of the Bannon/Trump/Alt-Right movement. Indeed, so many of the errors of this new so-called conservative movement stem from the divorce of conservatism from traditional political, philosophical, and theological values. Conservatism is no longer concerned with aiding the Church in guiding citizens to their supernatural end, forming a State which is conducive to virtue and contemplation. The Alt-Right is a reactionary movement. It is ordered simply to inverting the policies of the left. However, since it has unmoored itself from tradition, the Alt-Right shares with the left a Pelagian drive. It saves its citizens from secular globalism via the merits of secular nationalism. The issue with this article, however, is not its diagnosis of the Alt-Right but its misidentification of the source of its illness. Who is most culpable for Neopelagianism? Why, Neo-Thomism, of course. How Thomism, over and against the explicitly mentioned Molinism, is more guilty of a Pelagian mindset, I do not know. Indeed, the old De Auxiliis trope is that the Thomists have rejected Pelagianism so profoundly that they accidentally crossed over into Jansenism. This is, of course, absurd, but it helps to make the point. It’s unclear to me how anyone who is being intellectually honest could call Thomism (or “Neo-Thomism”) Randian or materialist. I would argue that Thomistic considerations of the common good, physical premotion, and the relation between nature and grace represent the perfect antithesis to true Neopelagianism. Kenney claims that Thomistic conceptions of providence and freedom are to blame for the crisis of Americanism. It’s unclear why a total separation between Church and State must be rooted in a strong premotivist account, one which requires that all fallen humans be moved directly and primarily by God’s healing grace to perform even the smallest of salutary acts. Pelagianism and secularism are intimately linked. A strong anti-Pelagian theology seems to be an odd source of secular politics. Kenney’s claim is that the Neopelagian, Neo-Thomists left the Church after Vatican II, when all of the emphasis on rules and regulations was left behind for mercy, something which Pope Francis has reiterated in his papacy. Kenney’s hypothesis betrays a serious error: anything which contains a hint of rigorism, dogmatism, or law is immediately rejected as pre-conciliar, Pelagian, materialist, and anti-Catholic. Therefore, the Thomistic regard for the order and understanding of the Faith are necessarily to blame for what ills American Catholicism. Unfortunately, such a view misses the robust tradition of Thomism and severely cheapens the teachings of the Second Vatican Council and Pope Francis. At the very least, this article is a helpful reminder that Catholics cannot be lured in by the fallacy to throw all enemies under the same bus. Kenney’s connections between Bannon and Neo-Thomism are less than tenuous; they’re non-existent. A proper reverence for nature and the created order is not materialism. St. Thomas, a disciple of the beatitudes, is certainly not an advocate of meritocracy. A total reliance upon divine grace is certainly not a foundation for Americanism or Pelagianism. I will go out on a limb and guess that Steve Bannon does not read very much St. Thomas or any of the “Neo-Thomist” commentators. And I would guess that Kenney would not have had to write this article if he did. The above video is a spectacular representation of the Christian life. 90 year old Justo Galledgo Martínez, a former Trappist monk, has spent the last 55 years constructing a cathedral virtually on his own. It is an impressive life’s work. Justo is a meager, frail man, but he has built something palatial, something which radiates the joy and beauty of the transcendent God. It is both his own and totally God’s. This is the human life well lived. Justo knows that he will not finish the cathedral in his lifetime. God willing, his work will be taken up by others. In keeping his eyes toward God, he will have drawn others into his work and into God. In the end, Justo has become consumed by his work. “I don’t want anything material. Any money. So I’ve gotten rid of everything, even my house.” Presumably Justo sleeps in his cathedral. This is not a hobby, something which he sets aside at supper time. Justo has rid himself of everything but his work, his gift to God. His work is his life. He wishes to be buried in his work, abandoning its completion to the hands of God. This is the Christian life, reaching up towards God, striving to touch Him, transforming the world in his own little, magnificent manner along the way. His Eminence Alfredo Ottaviani has certainly warranted the label of being one of the most divisive figures in the recent history of the Church. Elevated to the cardinalate by Pope Pius XII, he served as the Secretary of the Holy Office under John XXIII. Ottaviani was seen as a leading figure on the “conservative”, “old guard” side of the Second Vatican Council, drawing the ire of many prelates clamoring for change and openness in the Church’s relationship with an increasingly secular and adrift world. One of the most infamous moments from the Council came when Ottaviani spoke on the reform of the liturgy of the Roman Rite. “The rite of Holy Mass should not be treated as if it were a piece of cloth to be refashioned according to the whim of each generation,” he said. But the half-blind and nearly deaf Ottaviani was not received well. When his allotted time ended, a bell was rung which Ottaviani likely did not hear. After several minutes more, his microphone was turned off. Ottaviani returned to his seat in embarrassment while much applause burst forth from many of the Council Fathers. And, of course, there is the fabled story (of well-founded but not altogether certain authenticity) of a certain theologian from the Nouvelle Théologie camp micturating on the outside of the Holy Office, which is surely, at least in part, an appraisal of its Secretary. Ottaviani, along with his contemporary Reginald Garrigou-Lagrange, O.P., was seen as an enemy of the change desired by many in the Church. 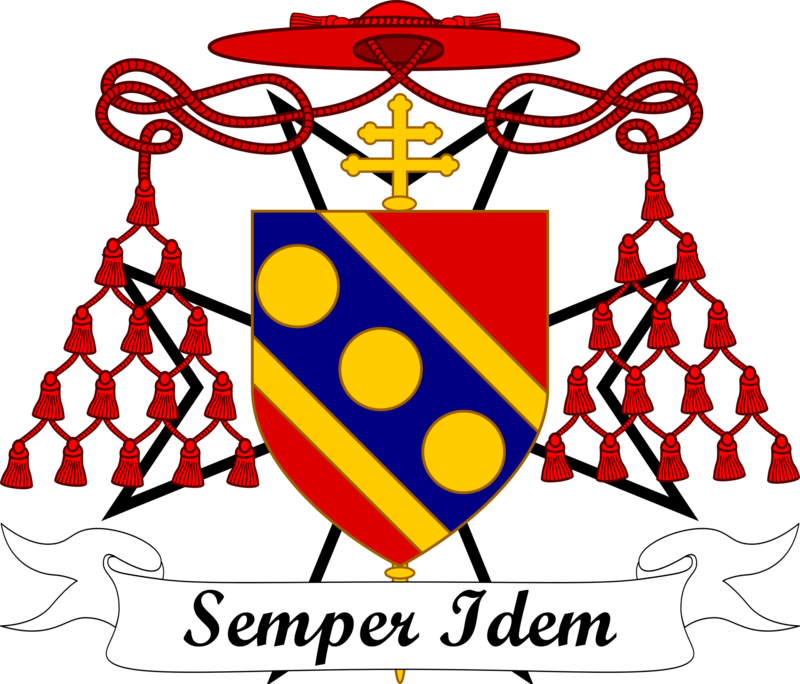 His episcopal motto stood as a hallmark of all that had fallen out of fashion in Rome: “Semper idem“. Always the same. There was a swelling eagerness among prelates in the Church to adapt to the 20th century. There were surely a myriad of rationes for this but a genuine concern to not lose the culture seems to have been chief among them. This is the concern which appears to have fueled much of Pope Francis’ papacy thus far, and it is certainly a good one. But does this put Cardinal Ottaviani and those who adhere to the “old guard” in opposition to Francis? Has the Church not moved on from this medieval, antiquated, stifling stance? It is of crucial importance to the Church that She revisit this discussion with proper nuance. What does Ottaviani’s motto really mean? Does it mean that the Church ought to eschew all true theological growth? Does it mean that there ought not to be organic development in the liturgy or in the way that the Church interacts with the modern world? I would propose that it speaks instead to a much deeper theological truth, i.e. that the content of the Faith is immutable insofar as its object is Immutability, the God of pure act, lacking potentiality in every way. While the face of the Church changes through the centuries, Her soul does not. She may present the treasures of the Deposit of Faith in new and varied ways, but the treasure itself is semper idem. This distinction between content and praxis is not ultimate, of course; content must always inform praxis. It is for this reason that one could create a list of “ought nots” in terms of viable means for the Church’s evangelization of the world. But we see in this distinction the life of the Church at work. Like a good mother, She educates and loves her children according to their age, needs, and varying circumstances. But there can be no love, no real nurturing of growth in the children, if content is not always obedient to unchanging truth. I should like to respond to a wonderful post made by my peer Joshua Madden on his blog Learning Christ in this, my inaugural post of Thomae Splendor. My words here are not meant to oppose Joshua’s post in any way, but merely to add something to them. A recent discussion on seeming tensions between, on the one hand, the Church’s proposal of the philosophy of St. Thomas as Her own (mostly to be found in Aeterni Patris, but also in other pontifical decrees) and, on the other, some words found within St. John Paul II’s Fides et Ratio felicitously triggered Joshua to return to the original Latin of Fides et Ratio, especially that of paragraph 78. 78. His praepositis cogitationibus, probe intellegitur cur subinde laudaverit Magisterium sancti Thomae philosophiae merita eundemque putaverit ductorem atque theologicae disciplinae exemplar. Nihil intererat philosophicas quasdam quaestiones complecti, neque imperare peculiares opinationes ut tenerentur. Magisterii propositum erat, atque est, significare quemadmodum sanctus Thomas germanum sit exemplar illorum qui veritatem perquirunt. Eius enim in meditatione rationis postulata et fidei vis altissimam invenerunt summam ex iis quae humana cogitatio unquam attigit, quippe qui Revelationis proprietatem radicitus tuitus sit, proprium rationis cursum numquam deprimendo. 78. It should be clear in the light of these reflections why the Magisterium has repeatedly acclaimed the merits of Saint Thomas’ thought and made him the guide and model for theological studies. This has not been in order to take a position on properly philosophical questions nor to demand adherence to particular theses. The Magisterium’s intention has always been to show how Saint Thomas is an authentic model for all who seek the truth. In his thinking, the demands of reason and the power of faith found the most elevated synthesis ever attained by human thought, for he could defend the radical newness introduced by Revelation without ever demeaning the venture proper to reason. 78. With these thoughts having been proposed, it is to be rightly understood that the Magisterium has repeatedly praised the merits of Saint Thomas’ philosophy and has esteemed him as the chief and exemplar of theological instruction. This has not been in the interest that certain philosophical questions be embraced, nor to demand that particular opinions be held. The proposition of the Magisterium has been, and continues to be, to signify in what manner Saint Thomas should be the genuine exemplar of those who diligently seek the truth. For in his contemplation the demands of reason and the power of faith have found the highest summit over anything that human thinking has ever attained; who having clearly considered the radical quality of Revelation, never demeaned the proper course of reason. The sections which Joshua has put in bold help to bring out two questions which are relevant to our discussion: 1) the question of St. Thomas as model/exemplar and 2) the question of whether the Church proposes “particular opinions” of Thomas to be held. 1) As is pointed out by Joshua, Fides et Ratio is not merely esteeming Thomas a model in a superficial sense. It is not calling simply for the Church to think in a mode similar to Thomas, to engage the discipline of theology in a way that might resemble Thomas in a vague sense. The encyclical cites the Magisterium’s praise for the actual “Thomae philosophiae“. This means that the content of St. Thomas’ philosophy is praised, not merely its method. In this we see a clear echoing of Leo’s words throughout Aeterni Patris. 2) However, it seems largely inconsequential whether we translate “Nihil intererat philosophicas quasdam quaestiones complecti, neque imperare peculiares opinationes ut tenerentur” as “This has not been in order to take a position on properly philosophical questions nor to demand adherence to particular theses” or “This has not been in the interest that certain philosophical questions be embraced, nor to demand that particular opinions be held”. It seems to me that both translations may be read to say pretty much the same thing, though not necessarily so. This is where there appears to be an ambiguity in the Latin that makes it hard to flesh out precisely what is being stated. The encyclical may be read in such a way that the high praise of the Magisterium for the philosophy of St. Thomas has not been intended to posit any particular content for adherence. On first glance, it may appear that the distinction between “properly philosophical questions” and “certain philosophical questions” gives us an out. The former translation appears to speak universally, about all questions which we might call philosophical, while the latter translation’s use of “certain” appears to speak in the particular (a variation of the logical “O” or “negato” categorical statement, “some… not”). But within the context of the encyclical, this line may also be read as speaking universally. Which “philosophical questions” are being addressed? Is it possible that “certain” (“quasdam“) is referring not to some questions among the many, but to all individual questions? The next phrase of this line is perhaps even more perplexing. The Church does not demand that “particular opinions be held”. Here “particular” seems to actually be used universally, but again, the Latin is ambiguous. Does the Church not demand that each particular opinion be held or does She not demand that any particular opinion be held? The usage of “certain” and “particular” (“quasdam” and “peculiares“) here seem to indicate only that we are talking about individual things. Another translation of “peculiares” is “specific” which would seem to speak more toward differentiating the things being spoken about rather than giving their number. This question of number is of the utmost importance in addressing any seeming tension between Aeterni Patris and Fides et Ratio. Does the Church demand some Thomistic opinions to be held or does She demand none to be held? In some sense, we may here be missing the forest for the trees, as it were. We know the tradition of the Church and thus we know the answer to the question proposed above. And for this reason I do not wish to say anything other than this: there appears the possibility of a tension which cannot be explained entirely by errors of translation. We know that, while a shift in emphasis is possible, there can be no direct contradiction between the teaching of Leo and John Paul II. We know that the popes have found themselves seated in various circumstances throughout history and that each pontificate contains various interests, concerns, etc. And yet, the Seat of Peter is tended to and safeguarded by the popes in such a way that Our Lord’s promise of indefectibility is never found wanting. It is the work, then, of theologians to make sense of any seeming tensions, either by showing that they were merely illusions all along, or, when sometimes real, by easing them with a constant mindfulness of the tradition and obedience to it.